It has almost been a year since the Boston Marathon bombings, and as I'm sure everyone else is saying, I can't believe it has been a year. Since that time, marathon finish lines always make me think of that day. I don't often read books that recap tragedies, but I made an exception for Hal Higdon. Higdon's training programs were a staple for me in my earlier running days, and I will always view him as one of the most prominent members of the running community. He is likely, in fact, the leader of the pack. Hal Higdon was not present at the Boston Marathon in 2013, but due to his status in the running world, he received many accounts of that day. 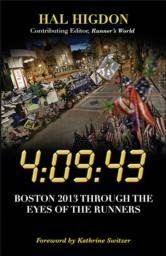 In 4:09:43 (the time on the clock when the first bomb went off), Higdon recounts the collective experiences of approximately 75 people, who were mostly runners and also some volunteers and spectators. Kathrine Switzer, a prominent runner/media person, writes the foreward. The stories that followed covered those who were close to the scene as well as those who were far removed, as well as those who qualified by time and those who were running for charities. Generally, they all kind of started the same way, the same as any story I'd have leading up to a race. Everything played out like any other marathon (with some waxing poetic of the prestige of Boston, of course), until the last few chapters of the book. Overall, I thought it was a good read. I would have liked to hear more about the spectators who were injured, but I suppose their stories have been told numerous times in the media. This book focuses more on the injuries that were supposedly not significant enough to count among the injured yet still traumatizing. For example, minor shrapnel hitting a runner's foot to ear canal damage were not recorded but still very real. It doesn't allude much to the culprits, which is a good thing. It's a book written for runners, by runners, as a way of sharing and coping. As the race approaches again (in the coming weeks), I look forward to following a completely ordinary day in Boston. FTC Disclaimer: I was sent a review copy of this book from Human Kinetics receiving no other compensation and am providing my honest opinion. Wow, I had no idea that he wrote this book! Now I know what I'm going to read next. Thanks for the review!